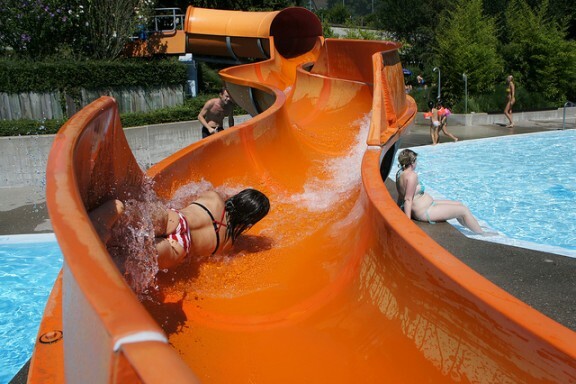 Top Five Waterparks in Europe – Book your Holiday Here! Here at Holiday Discount Centre, we love a good waterpark – and we know you do too! If you’re travelling with the family or even as a couple, spending a day whizzing down slides or bobbing along in a giant wave pool is hard to beat. So if you’d like to visit a waterpark on your next holiday, we’ve rounded up some of the very best around Europe. With a Thai theme and plenty of greenery to enjoy, Siam Park in Tenerife is one of the most popular waterparks in the world. As you might expect, the park has a wide selection of slides with the highlight being the Tower of Power – a 28-metre vertical drop that runs through a shark-filled aquarium! The Lazy River here is the longest in the world, transporting you on a journey through the park, while there’s an area especially for children, babies and a wave pool with the world’s biggest artificial waves. 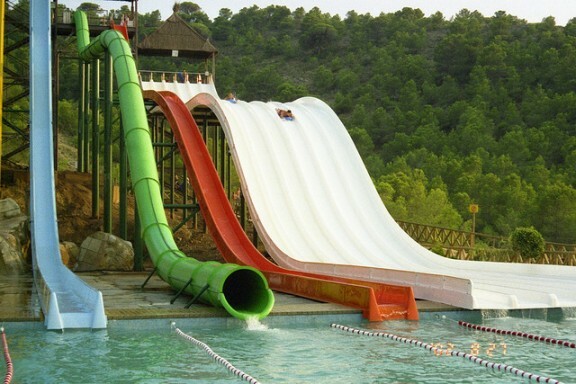 If you like your slides big, then they don’t come much bigger than at Aqualandia in Benidorm. The park is home to the Big-Bang, the highest chute in Europe, and is accompanied by a series of other freefall slides, while Verti-Go is said to be the highest capsule slide in the world. Travelling with younger children? They’ll be right at home in Adventureland – an area that’s especially for kids and featuring a number of smaller slides, as well as a giant waterfall to keep them entertained. 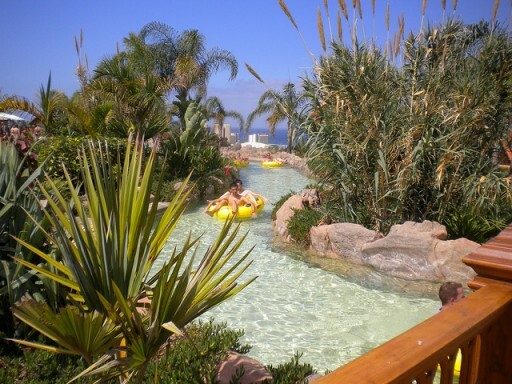 Many waterparks love a good theme, and WaterWorld in Ayia Napa is no different. The park is based on Ancient Greek mythology with many of its attractions having Greek names such as the Chariots Chase and the Aeolos Whirlpool. Children will love it here too with their very own areas including the Atlantis Activity Pool, Pegasus Children’s Pool and the Trojan Adventure. As well as the usual slides and flumes, Aqualandia in Italy has one amazing attraction in particular that’s not for the faint hearted. Captain Spacemaker is said to be one of the highest slides in the world at a height of 42 metres. Sitting in an inflatable raft and reaching speeds of up to 100 km/h, this is one water slide you’ll never forget. The park has seven themed areas with many different attractions including Funnyland (a small park just for kids), a bungee jumping tower and professional shows throughout the day. With an excellent mix of attractions for adults, teens and younger children, Tsilivi Water Park in Zante is always a fun day out. 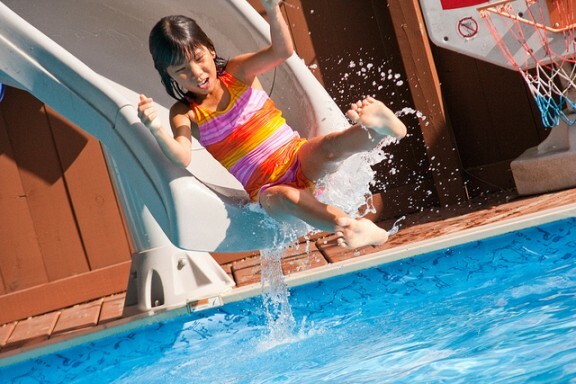 Highlights include a multitude of slides with rafts and inflatable rings, a kids-only area featuring pools and mini slides and a swimming pool and lazy river for those who simply want to relax, and soak up the sun. If you’d like to visit one of these waterparks, we’ve got plenty of holiday deals available so check them out here – and don’t forget your cossy! Images: Kullez, Stephen Jones, Pavel Rybin, Leonid Mamchenkov, Steven Depolo & Jean-Marc Bolfing via Flickr.